With a wide spreading growth habit, rather than upright, Acer palmatum Horizontalis makes an interesting addition to the garden. The growth habit is outwards with a natural arching or slightly pendulous habit. New foliage is a pale to lime green in spring, turning a deeper green in summer. Acer palmatum Horizontalis is a very hardy and tolerant tree once established, it does however perform better in cooler climates. In warmer areas protection from the hot afternoon sun will be beneficial. Water as required through the first few summers. Acer palmatum Horizontalis is grown for unusual yet attractive growth habit. It spreads out rather than up and over time develops a slight weeping habit. It makes an excellent low growing plant in the border, or a low feature tree in the broader landscape. As it will grow well in light shade it can also be used beneath larger deciduous trees to create a layered effect. Height – To around 2-3 metres in height, depending on climate and soil. Spread – Acer palmatum Horizontalis will form a crown of 2 metres across over time. Foliage – Green, turning to gold and red in autumn. Like most Japanese Maples, ‘Horizontalis’ does not generally require pruning and is best left to its natural growth habit. 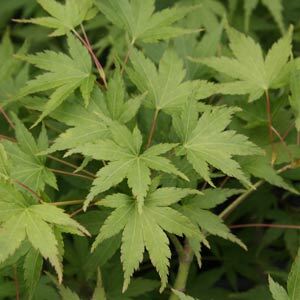 Acer palmatum ‘Horizontalis’ is available for sale from the following participating nurseries.